Ever wonder which foods to buy organic and which foods have the least amount of pesticide residue? Wouldn’t it be great if someone would do the research for you and just give you the top 12 that you should buy organic. 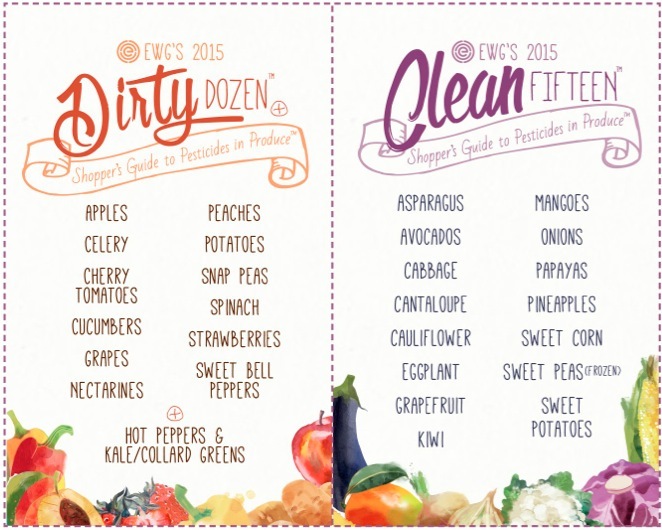 Dirty Dozen are foods to always buy organic. Clean Fifteen contain less than 4 pesticides on these non-organic foods. This guide is to assist the choice of when to buy organic foods (Dirty Dozen) and when there is the option to buy non-organic because the risk of pesticides is lower (Clean Fifteen). Or you can visit the EWG website to learn more about pesticides on food or the Environmental Working Group. Victories: gluten free! No sweet treats! I now have peanut butter that does not contain sugar, lots of fruits, and veggies. Im ready for the week, as I have cut up veggies to throw into eggs in the morning, carrots are cleaned for salads and munching and rice is prepared. I realized my two go-to items are not clean. My homemade trail mix contains cranberries which have added sugar and my salads have cranberries, processed dairy free cheese and Candied pecans. I will have to find alternatives. Maybe raisins instead of cranberries in my trail mix. I ate left over pizza sauce, processed pepperoni and gf white bread, which made it unsuccessful, along with chips and a flavored drink. I don’t think I over ate yesterday, which is a plus! Today I’m volunteering at a trail race and will probably eat some processed energy bars. I brought dried fruit to maybe hold me over. I went to make my homemade granola bars last night and they have loads of butter in them and brown sugar. I will have to find a different recipe. my August challenge includes staying under budget and eating clean. 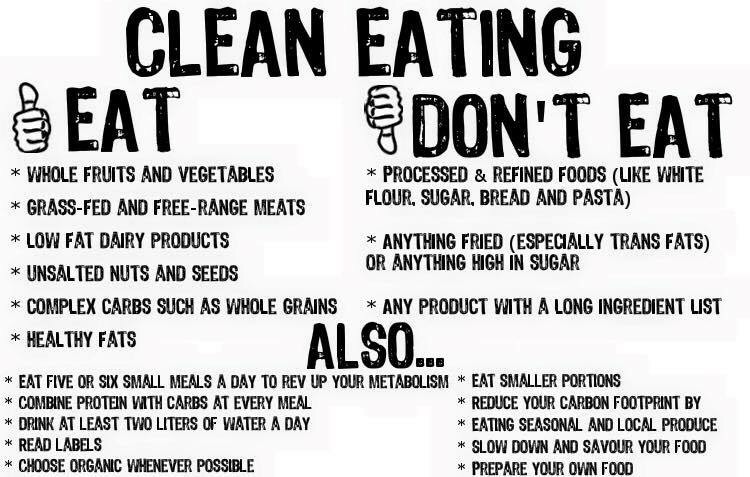 Eating clean involves foods that have less than 4 ingredients, they have ingredients I can pronounce and find in nature and has no added cane sugar. I’m adding gluten free to this definition. Spiced Meat (without sauce) is ok.
Rice and quinoa are ok.
Coconut milk is ok (even though it has chemicals). I may make an exception for Luna bars or potato chips with potatoes, salt and oil as ingredients (Fritos!). I haven’t decided where the line is just yet. Plant based protein is ok too. Home made trail mix has become my friend. I may have to use raisins instead of cranberries because of the added sugar. This also has chocolate in it, which may have to be an exception. For races, I can take my tried and trusted pro bar bolt chews and have brown sugar in my pre-race oatmeal. Actually I should make the day before a race a free day too so I can have my ritual pancakes and zucchini bread. Aside from that no flour-like sweet treats. Fruit (and maybe dark chocolate) will have to be my evening dessert. I’m also going to refrain from drinking Straight up juices which are as bad as sodas. I’ve always wanted to do this challenge. A few folks from November Project are doing it and have set up a support group on Facebook for us. I think it’s time I did this. I may have to pack up all my temptations and put them at a friends place during the challenge so I at least don’t cheat at home. This challenge of running two half marathons in one weekend was certainly a learning event and an experiment. This post is about what I did leading up to the back to back races and also what foods I ate (and should have ate) between the two races. Leading up to this double half marathon weekend I took some measures, also because I was going for a specific goal on the first half. Fueling is important when running a half marathon, but what if you are running two halfs within a 25 hour time period? It takes 24-48 hours for food to be stored as glycogen for muscle use so basically you have to start eating during your run or right after! But at the same time you don’t want to be full for the race the next day. The goal is to eat simple, low-fiber carbs (high-glycemic index), which convert quickly to energy in between the two half marathons. Here’s a listing of what I ate after crossing the finish line of the first half marathon and before I went to bed. You can see what I ate the morning of the second half marathon on my RnR SF race report. I didn’t eat even close to 2000-2600 calories between the finish line and the start of the next race. I wasn’t hungry at 3:30am before race #2 but by the time I got to the starting corral I was starving and my tummy was audibly rumbling. I was concerned about putting more gels (sugary substances) in my stomach and whether it would hold up (it did!). I didn’t plan ahead of time the list of simple, low-fiber, high glycemic index carbs that I should eat, so I just went with what I felt like eating, which wasn’t much. Stridebox is a company that gathers sample items you may not have tried and sends them to you on a monthly basis. I gave it a go and this is what came in the box. A number of food products, a shoe lace contraption, a sticker and something that says skin strong and slather on it. Not sure what whether it’s lotion or body glide. There are a number of other companies out there doing this for runners like Runnerbox, Bulubox, Fitbox and even ones for non runners like Naturebox. 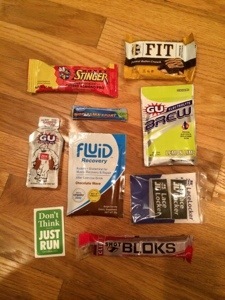 Do you subscribe to a monthly goodie box, running related or not, and if so, which one? Today I ran a 10 mile race but quickly ate all the calories I had burned. Props to myself for deciding not to grab a burger this evening, my new year’s resolution is to be ovo-vegetarian. Ovo-vegetarian may prove to be quite difficult with my overall love of food. Recipe ideas for the cabbage would be appreciated! After a full week of eating anything I want including TWO gluten and dairy filled Cheesecake Factory cheesecakes, I am going on a 5 day veggie cleanse. Today, I started with mixed greens, rice cheese (yeah, I allowed myself this processed food), craisins, and pecans. I went on to have just raw veggies and fruit as snacks. Finished with a few pieces of dark chocolate. I’m excited for tomorrow’s meals: butternut squash smoothie for breakfast and quinoa pb&j for lunch. I’m also doing a wallet cleanse too by only buying necessities for the rest of the month. I already have my feb wish list started. Considering trying to do a running race every month this year. Already have Jan, March, may, august, sept, oct lined up. After various incidents of hysteria over the pond, I decided that it was probably a good idea to email Starbucks UK to find out what is, and isn’t, gluten-free over here. Because, it’s not clear, and there’s an awful lot of conjecture going on. I was pleasantly surprised. The nice chap who replied did so at about midnight (graveyard customer service shift) and emailed the following. Verbatim. So this is obviously a standard reply. Why it’s not easy to find on the website, I don’t know. Information correct as of 14th November 2013. Bear in mind that there is the potential for cross-contamination because of the way the stores are organised and run, and use your own judgement. I can confirm that none of our hand crafted beverages currently available in our stores are made with ingredients that contain wheat or gluten. It’s been many years since I’ve seen such darkness and bright stars in the sky. It was 4:30 AM. I use the sound of waves crashing as my guide to the paved path next to the beach. Previously mapping out the route, it would be short out and back for a total of two miles. This was the “warm up” for the half marathon because the training program that day called for 15 miles and previous experience suggested that after running a half, my body would balk at following that with another 2 miles. Very good decision because I sprinted at the end of the marathon to the finish. It was difficult to see my watch and there were a lot of people walking the opposite direction, including one gentleman who didn’t speak much English who asked if he was going in the right direction for the half (he was). My concern grew that I wouldn’t make it in time even though I had meticulously planned out a 13 min/mile pace for this warm up. Turning back at just .66 miles, I decide it was enough with the extra .1 mile of the 13.1 and the race pace I am sure to be hitting would make up for it. At the start, now 5:18 AM runners were wandering around, looking into doors and restaurants. Gut instinct said they were looking for bathrooms. This rerouted me back to my hotel room to alleviate my bladder one last time and to offload the breakfast bar that I would no longer have time to eat. This jaunt fulfilled the 2 mile warm up (and then some). runners were lined up in the corrals and the other half were stretching and standing around. There was a lack of energy in the air that usually fills the corrals in a race, perhaps it was the time of day or that Hawaiian spirit. No seeding was in place, maybe due to the size of the participants (later I found out that the marathon had seeding), so I hung out in the back. This was going to be a relaxed race, just like my March half, because it was mid-training. I even made a pace band that was just 3 mins faster than my spring half to keep me from going to fast (this backfired). I wriggled into the corral just a little bit after that and the crowd surged forward as anticipation for the gun to sound increased. I looked down at my watch and was happy to see that it found GPS because on three previous attempts by the ocean failed and I thought I’d have to use my iPhone for to track this memorable event. Before I knew it I was crossing the start (was there a gun or someone that yelled “Go!”? If so, I don’t recall it). The crowd thinned quickly and I was able to slow my pace after catching a street lamp on my watch, which said my heart rate was above 150. I had enough in me to sprint the last .1 mile and I took note that it was with good form (mid foot strike instead of heal). After obtaining the medal, with shell necklace, one last photo for the record book, I grabbed a glass of water, a half of a banana, some type of coconut popsicle and left the shoot. (They also had red delicious apples, and milk for the runners). The goodie bag had a livestrong-like bracelet, SPF 15 Chapstick and a men’s sizing only tech tee. The expo was small, but I bought a few items and they had a lavish carbo load dinner (@$55) and an after party (round table pizza, @$35). There were 17 aid stations for the full marathon; with the out and back course for the half, this included 5 of those. There was music along the way, and tons of people in volunteer shirts. At the finish, were cheer leaders and live bands playing. They had a full medical tent ready for the runners with hanging IVs and gurneies. Highly organized – the only thing I would comment on is more food choices at the end with bottles of water (a cup was not enough) and to move the food shoot back away from the finish and spread out the food items. I walked around and stretched. I ate my half of a banana, and then to get the wrapper off the pop, had to down my cup of water. With that gone, and knowing I needed more, I walked back to the hotel. The pop was hard to eat and more of it dripped off than went into my mouth. With water, a bag and Chapstick acquired and some items offloaded, I went back to the finish to cheer others on and exchange the men’s small for a men’s medium for Luv. Only then did I decide I should try to eat something, since the half of a banana and two bites of a pop were clearly not enough. At 9 AM, brunch was still being served at my hotel. The fruit tasted so good and they had potatoes roasted with onions and peppers which danced on my tongue. Getting up from the table for a round of protein, my knees were stiff and ached. Uh oh. This is not good. Was it the way I ran, the higher temperatures or the choices I would make the rest of the day (not icing right away, sitting in a sauna, eating meat?)? Those questions are still not answered and I was in tears by the end of the night. I have not been in physical pain for a number of weeks now and have lost my tolerance. Right now in my running career, I’m trying to run faster with good form (sub 10min/mile). I’m also trying to run slower with good form (below 150 bpm). This is proving to be difficult. 1. Create custom “negative spilts” pace band. At mile 2 I freaked that I was 6+ minutes behind, but looking back, I was probably that far behind during the spring half, I always need time to warm up. 2. Practice race pace (10min/mile) for 2 miles at a time after warming up with good form. Increase to see if I can replicate knee pain. Need to find out why this occurred. Was it lack of training with this new form? Is it just the way my body is? Can self massage of the hips help? This was my first destination half marathon. Planning was key: making the rice, pancakes, oatmeal, ahead of time and packing it along with fruit, and veggies in throw away containers. This provided me with meals I knew were within my pre-race diet throughout the plane ride. I need to keep in mind that if I travel on Friday for a Sunday race that fruits and veggies may not be allowed at my destination. Knowing the temperature and weather conditions that were possible was also important: hat, sunglasses, sunscreen, shorts, tank top or t-shirt, even down to the pair of socks. Pack light and put your shoes in your carry on. The expo most-likely will have clothes, but no guarantee they will have your exact brand, style and size of shoe if your luggage is delayed or lost. (This did not happen to me, but there have been horror stories). Regarding #4 above, I just finished reading Eat and Run and am considering a more vegan diet. Currently, I avoid gluten and dairy, tracking when it is consumed. So the plan is to start tracking meat intake to see if its a factor. More so, may be the gluten free donuts, cinnamon rolls, cakes, etc that I crave. The convenience of convenience food and time it takes to prepare nutritious food is a deterrent some weeks. On the hopeful side, maybe a more raw diet would allow me to have gluten again – my csa farm grows different types of wheat so I could try a less commercial brand of flour.